Yea for Saturdays!! I told the Littlest that I might hold him and cuddle him ALL DAY LONG, just because I can! He wasn't too impressed with the idea... he was actually squirming out of my arms as fast as he could at that moment. 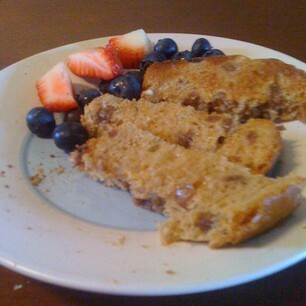 We are sitting here enjoying our raisin toast and berries, and looking outside to a beautiful blue sky. It seemed like a long week, and I am definitely ready to move on to the next. Soren starts daycare on Monday, so next week will be an adjustment for us but I'm not going to think about that today. Today, we are going to play outside, go for walks, and get ready for a Mother's Day Tea that we are hosting tomorrow! We're crossing our fingers that the weather stays nice tomorrow, so that we can take advantage of the extra seating areas out on the deck. Tyler has been working around the clock to spruce up our backyard, and I will have to post some pictures soon. It's very impressive! Soren turns 11 months today! Happy 11 months - little guy. I love you so, so much! I think this picture was taken right after his first bath at home, probably around 4 or 5 days old. He had a lot more hair at that time!